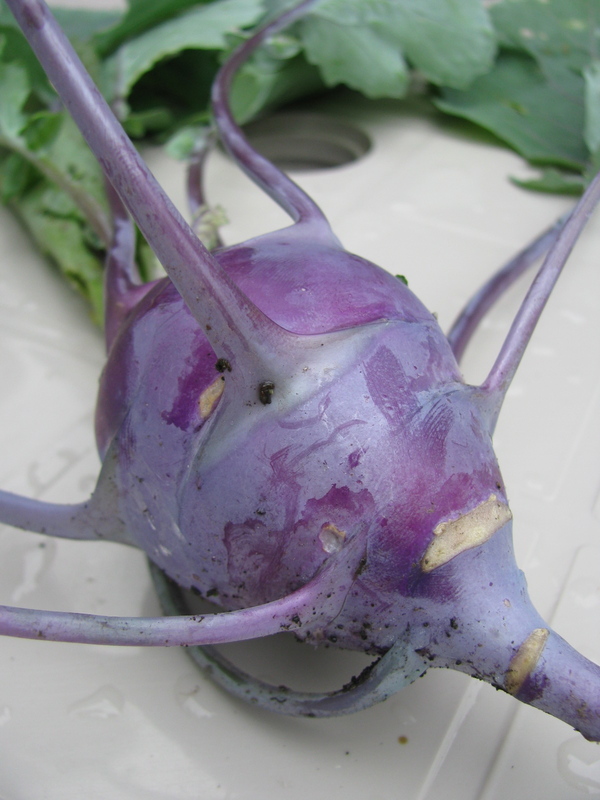 I grew a kohlrabi in the garden this summer (yeah, just the one!) and have been fascinated by them ever since. They have a firm texture and the flavor is a cross between a broccoli stem and cabbage. I bought a couple from Wayward Seed Farm at the farmers market this weekend along with carrots and a bunch of radishes. These kohlrabi were green and looked even more like little alien beings. A lot of winter foods are soups and stews and while they are wonderfully warming, I enjoy having something crunchy and refreshing as a contrast, especially on a crisp sunny day. After yesterday’s excess of cheese and pork products a salad seemed like appropriate. This salad was inspired by Peter Berley’s Shaved spring vegetable and apple salad from The Flexitarian Table which I have made in the past. Berley uses sunchokes and fennel and I think you could substitute celery root as well. I love fennel but I know but I think this version might have a little broader appeal. Instead of using a mandolin for all of the ingredients I cut them into matchsticks and only used the mandolin for a couple of baby onions. 1 bunch of french breakfast radishes, trimmed. Toast the walnuts in a 350ºF oven for 10-12 minutes. You should be able to smell when they are done but keep an eye on them so they don’t burn. Peel the kohlrabi and the carrot. 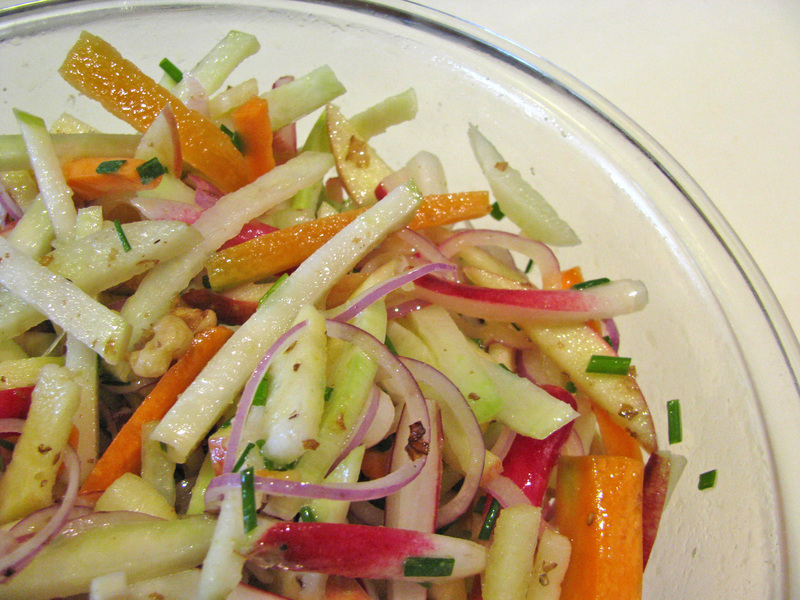 Cut the vegetables and apple into matchsticks and place in a large bowl. Depending on the size of the radishes you may just want to quarter them. Mandolin or finely slice the onions and add to the other vegetables. Whisk the dressing ingredients together and pour over the vegetables. Snip the chives with scissors over the bowl and combine everything. Add the cooled walnuts, toss, cover and refrigerate. This salad is great if you have time to let it sit for an hour or so before you eat it. It lets the dressing soak in and the flavors mingle and its best if you can toss it a few times. With a bowl of soup and a hunk of french bread it made for a very satisfying lunch. That salad is so pretty. I think you have some great flavors going on too.